Here are 3 free Windows 8 sticky note apps that lets you create notes of all your important tasks, or things that you need to remember. Just add a note and input anything you want to remember so that you can accomplish it before you call off your day. You can create as many notes as you want and can arrange them according to your preferences. StickyNote is a good utility Windows 8 note app that lets you create colorful notes and write down anything that comes in your mind. It lets you create multiple notes. You can keep your notes organized, move notes to a different place around the screen, resize you notes, search for a specific note, and the like. You can also change the background. Yup.. the note taking app comes with a list of beautiful backgrounds and you can change it anytime. For this, you need to right-click anywhere on the screen ? you ill get all the options in the below opened horizontal panel. Go ahead and download StickyNote app in Windows 8 now. Color Notes is another free sticky note app for Windows 8 where you can write down things that you do not want to forget or you use it for writing down your thoughts anytime when they come up in your mind. You can easily set the color of you notes according to your likings. However, this note taking Windows 8 app comes with three different tiles. Unlike other note apps for Windows 8, Color Notes does not allow you to add more tile to it and you have to manage taking notes using only those three tiles. Nonetheless.. its quite interesting to create notes on this colorful tiles. In addition, you can also pin notes to start screen so that you can track them every time you head over to the Windows 8 Start Screen. Go ahead and download Color Notes app in Windows 8 now. 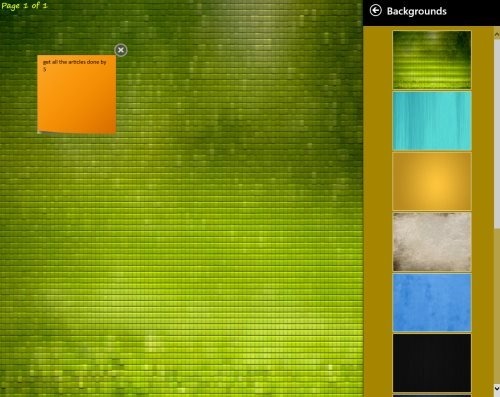 Sticky Notes 8 is a powerful Windows 8 note app where you can add as many sticky note tiles as you want and that too in different colors, thereby creating a colorful sticky notes screen. Each added note comes with different options: Pin to Start, Lock/Unlock, Share a note, Expand the size of a note, and Delete it. The app auto-save you notes as soon as you type something in it. However, you need to enable the auto-save option. You can also import or export notes to your local machine. It’s a good utility Windows 8 note app. 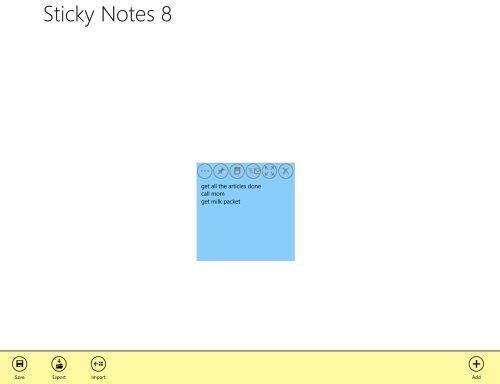 Go ahead and download Sticky Notes 8 in Windows 8 now.